My past experiences have taught me that it’s important to be challenged with things that are unfamiliar and to step outside your comfort zone. However, fear and anxiety are emotions that can be so debilitating that it can be very difficult to take that initial step out of your comfort zone. But sometimes it’s okay to be scared and it’s okay to be anxious, after all, we are human. Nonetheless, the problem remains when we stay scared and avoid the things that make us afraid. We can overcome fear by becoming friends with it and become used to the feelings of fear; if you tell yourself that it’s not okay to be afraid, then you are still going to be afraid. When you feel like fear has a hold on you every day, hang in there. All you need to do is take one step at a time. Coleman Young says, “Courage is one step ahead of fear.” This painting is about having the courage to take the initial step to overcome your fears so that you can ultimately achieve your goals. (Menkaure and His Queen: 1. Discovery). The female figure in this painting steps forward confidently despite her fears and anxieties. Her face thrusts forward with determination and strength. She is standing in a frontal pose with a stiff and rigid posture and her arms and hands are close to her body. 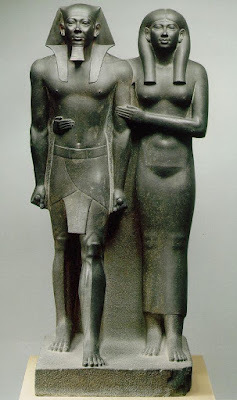 In this regard, I adopted many of these features from the Egyptian and archaic Greek figures, such as Menkaure and his Queen (shown below) and Kouros Statue of Youth (600 BCE). The depiction of rigid postures and the lack of emotion on the sculptures were a symbol of timelessness and strength of the divine. The left foot forward stance in this painting resembles the Egyptians and archaic Greeks sculptures not only physically but also symbolically. Some suggest that Egyptians chose this pose because, “the left side of your body is where the heart is and therefore you step with the left foot to trod out evil so the heart could proceed.” It also could mean the mark of a new beginning which is suggested in The Book of the Dead. We also use it modern times, the military uses it when they are marching (left, right, left..). It makes sense since many people in battle hold their weapon with their right hand and so in order to have a better fighting posture they need to step with their left foot. The female figure in the painting walks with her heart. Although she is guided by her feelings and emotions, she is a warrior and is ready to fight her battles when needed. The female figure has thick colorful impasto paint on her chest which symbolizes heaviness, pressure, and fear. When someone is in an emotional state they are bombarded with physical sensations, especially when they are in a fearful or anxious state. Researchers studied how emotions such as happiness, nervousness, and anger feel in the body. 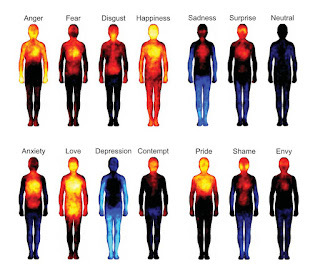 The body maps in the image below are constructed based on the descriptions of 701 participants who were asked to describe how they experienced emotions allowing researchers to map out 14 emotions. The bodily maps show the most active reactions to emotions highlighted with yellow and red, while the slow or absent reactions are illustrated with shades of blue.It is clear to see that participants concluded that when they are anxious or fearful, they feel it in their chest similarly to the female figure in the painting. Although the sensations and pressure of fear can be debilitating we can choose to identify the parts of fear that need to be tackled, so that we can take a step forward to a more fruitful life. Instead of pushing anxiety and fear away, sit with it and watch yourself move forward over time.